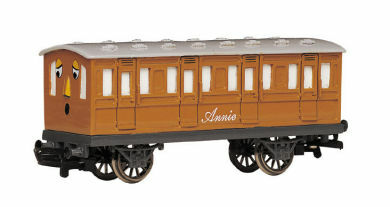 The coach that was to be the basis for Annie was first built by a teenage Wilbert Awdry as part of a model railway layout. Many years later, after a long hiatus from modelling, a brake coach was built to match so that the Reverend's Thomas model would have a complete train. In the Railway Series, they are a pair of bogie coaches (i.e. each coach is supported on a pair of four-wheeled bogies or "trucks"). As currently illustrated, they appear similar to non-corridor suburban coaches operated by the LMS.